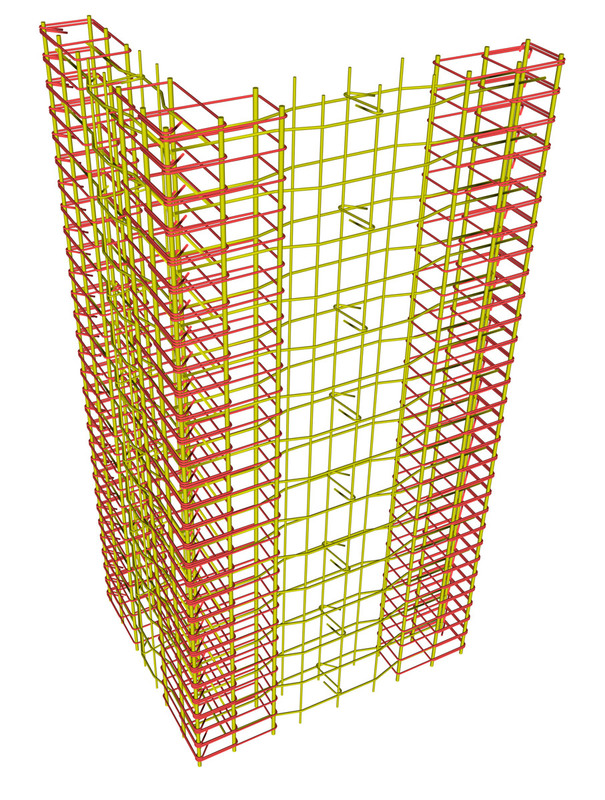 A composite column is every vertical element composed by a number of rectangular members, one of which is considered to be a shear wall i.e. 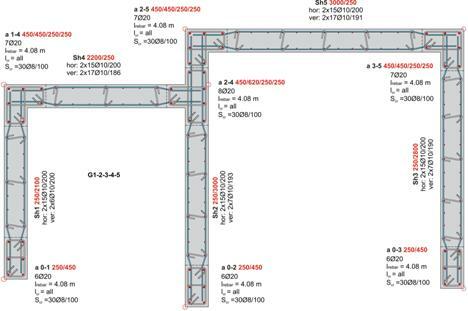 has a length to thickness ratio ≥ 4. 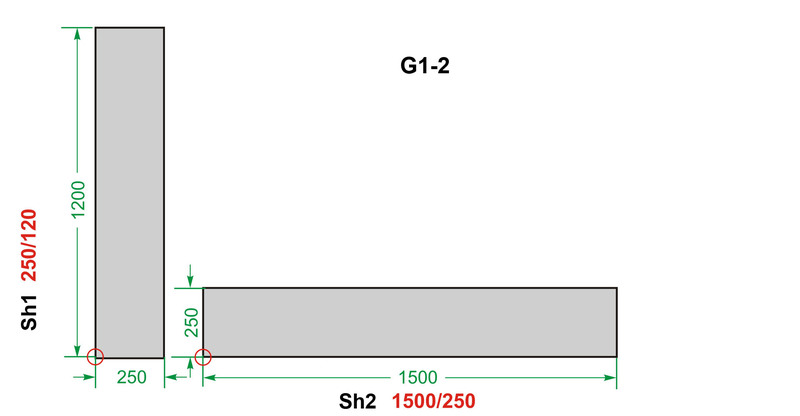 The simplest composite column is the one-member shear wall, like G1. 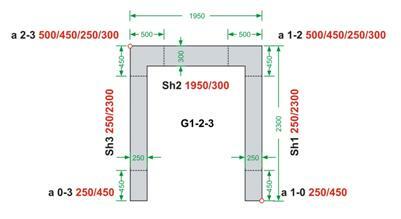 From a static point of view, G1 is composed of the shear wall Sh1 which has a section equal to 2000/250. 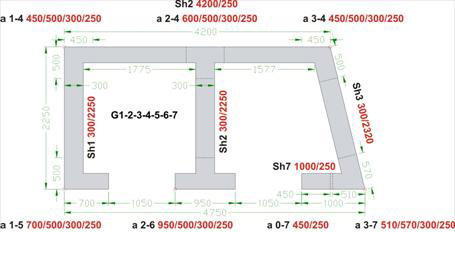 From a reinforcement point of view, G1 is composed of the hidden (boundary) columns a0-1 and a1-0 with 250/450 section and the shear wall’s main body Sh1 with a section of 2000/250 (including the length of the two boundary columns). 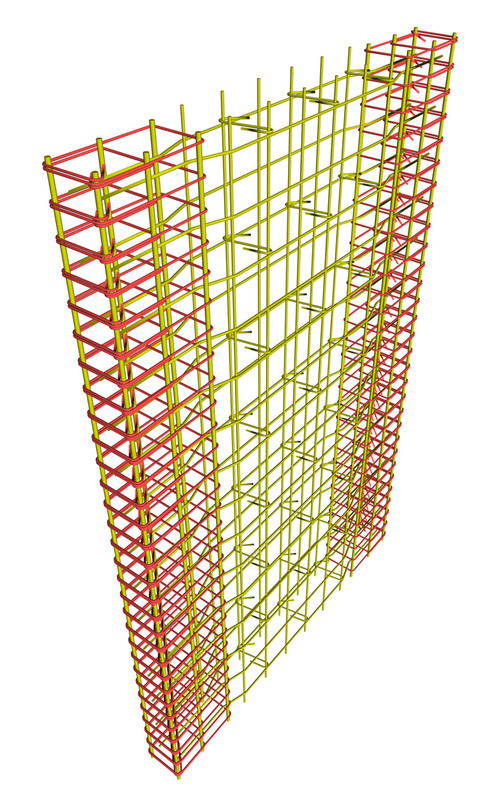 The G1 reinforcement consists of the clearly defined reinforcement of the three members that comprise the composite element, the two orthogonal columns and the shear wall’s main body. In this specific example as well as in the others that follow, the horizontal rebars have been anchored by bending. It is obvious that any other type of anchorage from those mentioned in the previous chapter could have been chosen. 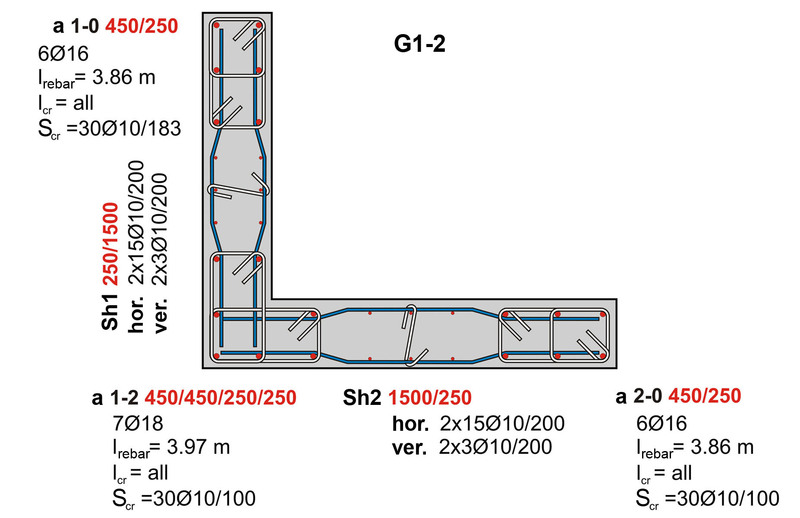 The ‘Γ’ section element G2-3 is a composite element consisting of two members. 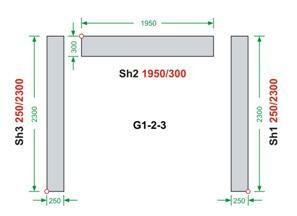 From a static point of view, the G2-3 is composed of the column C2 which has a 250/700 sec-tion and the shear wall Sh3 with length and thickness equal to 1500 mm and 250 mm respec-tively. 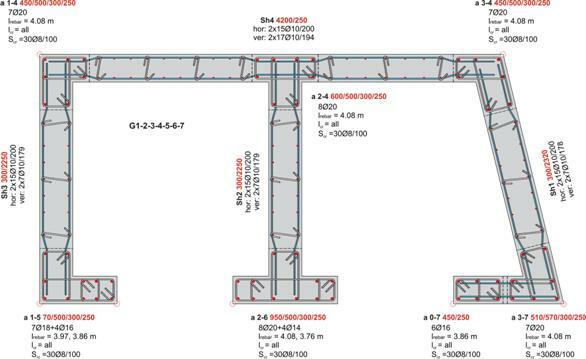 From a reinforcement point of view, the G2-3 consists of two boundary (hidden) columns: the 450/700/250/250 ‘Γ’ section column, the rectangular column a3-0 with a cross section of 250/450 and the shear wall’s main body Sh3 with a section equal to 1500/250. 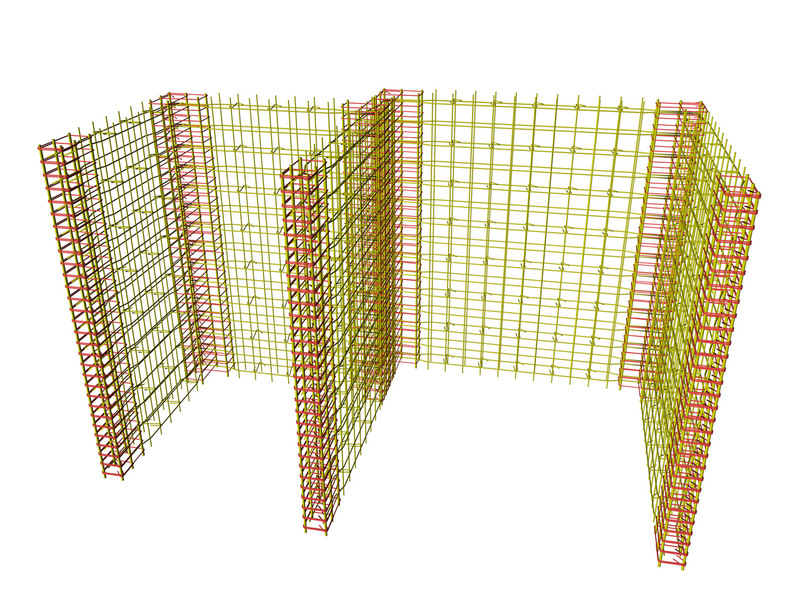 The reinforcement of G2-3 is composed of the clearly defined reinforcement of the three mem-bers that comprise the composite element, the two columns and the shear wall’s main body. 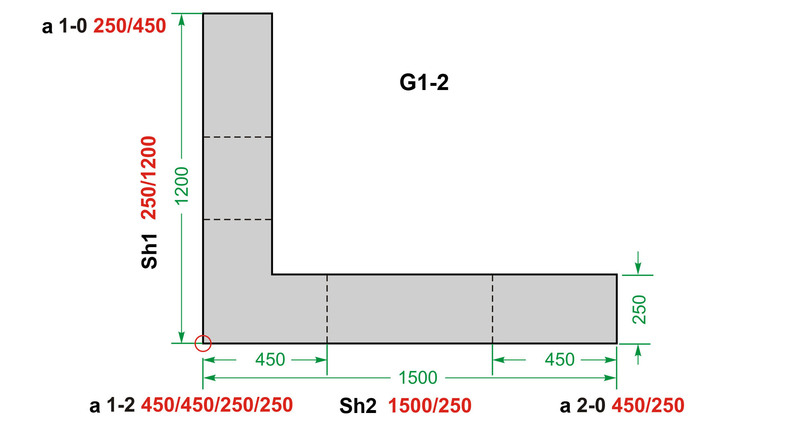 The ‘Γ’ section element G1-2 is a composite element that consists of two members. 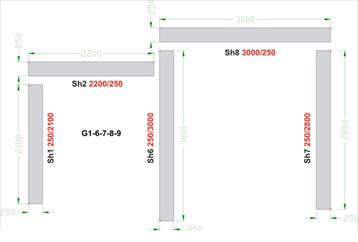 From a static point of view, the G1-2 is composed of the shear wall Sh1 which has a 250/1200 section and the shear wall Sh2 with length and thickness equal to 1500 mm and 250 mm re-spectively. 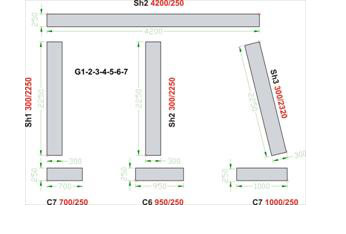 From a reinforcement point of view, the G1-2 consists of three boundary (hidden) columns: the 450/450/250/250 ‘Γ’ section column a1-2, the rectangular column a1-0 with a cross section of 250/450, the 450/250 rectangular column a2-0 and the shear walls’ main bodies Sh1 and Sh2 with sections equal to 250/1200 and 1500/250 respectively. 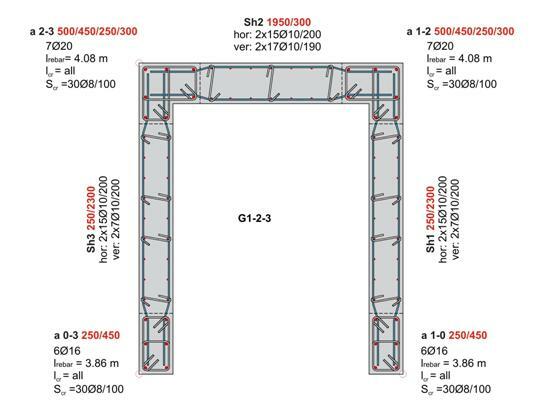 The reinforcement of G1-2 consists of the clearly defined reinforcement of the five members that comprise the composite element, the three columns and the two shear wall main bodies. 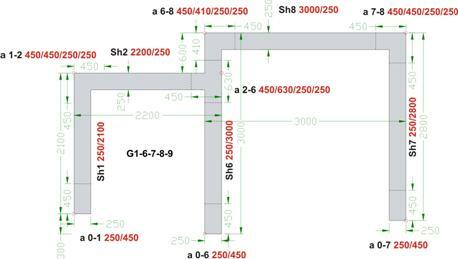 The columns a 2-4 and a 2-5 could have been constructed as a single ‘Z’ section column.